City Year Chicago’s (CYChi) incoming cohort of 230 corps members – AmeriCorps members ages 17 to 25 from across the country selected through a competitive application process – pledged to dedicate the next year of their lives to serve and make an impact across 26 Chicago Public School (CPS) neighborhood schools at the CYChi opening day ceremony at Roosevelt University’s Goodman Center. 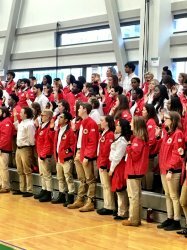 Opening day ceremonies take place in each of the 28 City Year sites across the U.S. in August and September to mark the literal and symbolic start of a new school year in which thousands of corps members will help improve students’ educational outcomes and opportunities. 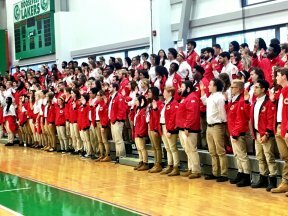 At these ceremonies, corps members receive the signature red jackets that distinguish them throughout the school year. City Year works to bridge the gap in high-poverty communities between the support the students in the communities actually need and what their schools are designed to provide. 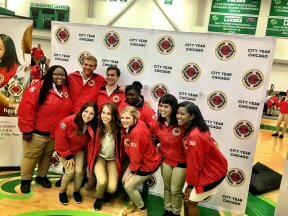 At the heart of City Year’s model are corps members, whose duties can include: providing one-on-one tutoring; running afterschool clubs and service projects; communicating with students and parents regularly regarding attendance and student progress; and organizing and leading activities, celebrations and projects that enrich the school community.